..... Click the link for more information. , class Magnoliopsida, order Violales. One of the most common houseplants. 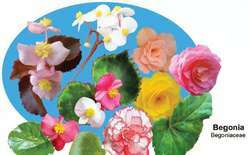 There are many edible varieties, including Wax Begonia and Tuberous Begonia. Double check online to make sure which ones. People all over the world have been consuming Begonias for a long time, both flowers and leaves, raw or cooked. Flowers have a citrus, sour taste and make a beautiful garnish.. Medicinally, they have been used to help glucose levels in diabetics, and made into tea for those with colds. Shoots have been used for stomach and spleen problems. Used for anti-tumor and anticancer properties. The leaves and flowers can be eaten raw, stems eaten like rhubarb. Contain oxalic acid, so don’t eat if you have kidney stones, gout or rheumatism. Don’t go crazy, start easy. a genus of plants of the family Begoniaceae. Begonias are shrubs (rarely, climbing ones) or subshrubs. They are herbs with creeping or tuberously thickened rhizomes that sometimes have tubers. The leaves are generally asymmetrical and are often beautifully colored (especially in cultivated species). The flowers are irregular and unisexual or monoecious. The leaflets of the perianth are irregular and brightly colored. The fruit of the begonia is a pod. There are approximately 800 species of begonias in the tropics and subtropics (except Australia). Many species are grown indoors and in the ground as decorative plants. Begonias are classified as shrubs or tuberous plants (with abundant, brightly colored flowers) and leafy plants (with beautifully colored leaves). Some species of begonias have creeping forms that are used as hanging plants. Begonias reproduce by seeds, cuttings, and leaves (even parts of them) that produce shoots from the newly formed adventitious buds. Mnogoletnie tsvety otkrytogo grunta. Moscow, 1959. To order by debit/credit card, call 0843 922 5000 quoting DM32770, or send a cheque made payable to MGN DM32770 to Begonia Apricot Cascades Offer (DM32770), PO Box 64, South West District Office, Manchester, M16 9HY. So begonias also have standard chloroplasts, which provide energy in plentiful sunshine. Many begonia grow near the undergrowth of tropical rainforests, where the tree canopy is usually quite thick and lets through very little light, forcing plants under the canopy to harvest every little bit of light they can find. Dragon Wing Red Begonia, a Harris Seeds favorite, outperformed other begonias in garden trials. Begonias are considered to be sensitive to high light and perform best under low-light conditions found in shade gardens or along the north side of houses. Like all begonias, the Rex types need excellent drainage. A decade ago, Booman decided to solve the problems afflicting previous generations of rex begonias, including a tendency toward salt burn on foliage (exacerbated by the West's generally alkaline water) and a long winter dormancy period. Begonias are best growing in full sun, but they'll put up with partial shade. Where begonias are being grown in pots they can die back naturally. The summer garden "Zomerhof" will be open from August 2nd through September 16th and will display flowers like begonias, dahlias, lilies and other varieties. He has won countless awards for his prize begonias over the years and has loved gardening ever since he was a child growing up in his father's nursery.